It's a well-known fact that the most cost-efficent way to repair supercomputers is to use robot mice. At least it is in Micro Mouse. Here, electronic mice are used to repair the burnt-out circuit boards of computers. But before they can do any of this they need to be trained. That's your job. 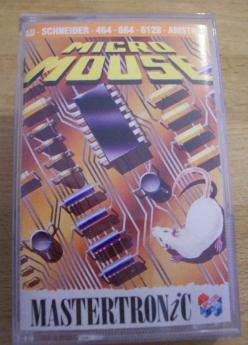 You take control of the little rodent as he scampers around the circuit board looking for breaks in the tracks to mend. As always, things aren't as simple as they could be, and miniature baddies patrol the circuit intent on causing as much mischief as they can. The beasties come in three varieties. One type runs round the circuit randomly, inflicting damage when it runs over you. Then there are others which actively come looking for you. The third category is a kind that causes damage to the circuit board as well as to your furry friend. Unfortunately, your little mouse is defenceless against these energy-zapping nasties, and the only thing for it is to avoid them. Movement is confined to running along the tracks of the circuit board. So if a nasty is heading your way and there's one approaching from behind then it's curtains. This is one of the game's shortcomings. It's very difficult to avoid collision once there's a beastie on your tail. Graphically, it ain't no oil painting. The backgrounds are not particularly well drawn and the sprites are miniscule - maybe that's why it's called Micro Mouse! Nevertheless, they are functional, and everything looks clear enough - nothing gets confused with anything else. Soundwise, the game is a stunner, with a really excellent title tune, You know the sort of thing - lots of little pitch bend effects. In the game, though, it's back to basic spot effects. You can't have everything. The idea behind Micro Mouse sounds good. The game is well programmed, and well polished. Sad to say, then, when it comes down to playing the game it rapidly becomes tedious. The nasties become inescapable, and it's just not fun to play.